I think I just made it under the wire. so I could machine bind them tonight. I am planning on donating to Margaret's Hope Chest. They are local near my dad and I can drop them off when this craziness with my dad subsides a little bit. The back, which is really a light green with the black. I had to take photos in the darkish as I was feverishly working on the binding! I had Liz quilt a football pattern into them and am pretty happy how they came out. 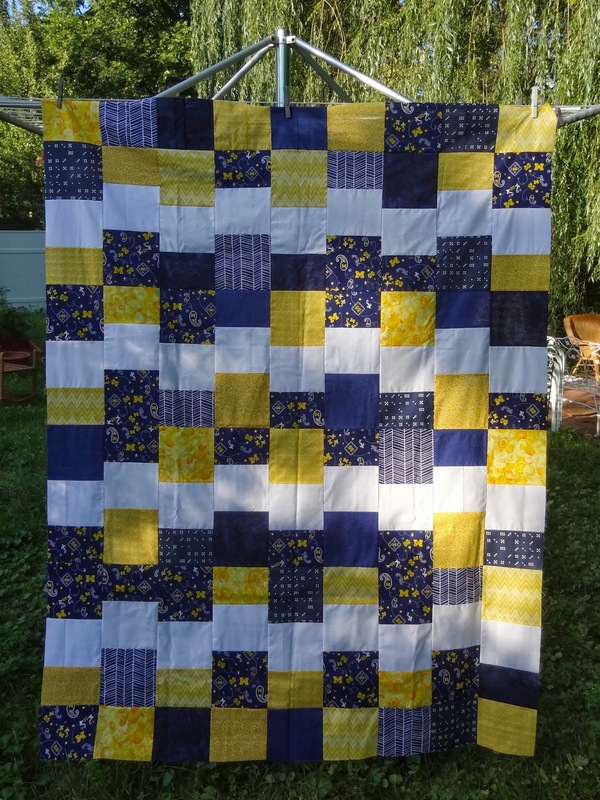 I am happy I was able to link up to 100 Quilts for Kids too! I had the pleasure of making some X and + blocks for our September bee block. It is the first time I have made these blocks. How much fun are they to make??? I can see a whole quilt with these in my future for sure! Fussy cutting those moths was awesome! These finish at 12.5 so will be 12" when put into a quilt. Yeah finally a finish of something. This post is linked up to Amanda Jean's Finish it up Friday. Ever Feel Like The Camel? Have you ever had a stretch of time where you thought that one more straw and you would break? I've been going through such a time. The stuff that's happening is WAY too much to talk about and kinda hard, but a few of my friends know everything that's going on so I do have some great support, so don't worry! I often think that sometimes, when you are waiting for that "last straw" God puts some people in your path that make the load lighter, help shoulder the burden so to speak. Become your own herd of camels. So I wanted to take a minute and tell you about a couple members that have just joined my herd. First up is my friend Tracey. We met during the Tula Pink swap I am hosting. She has been a Godsend in helping me and Sylvia stay organized. She listens to me, we video chat and she has offered to take over the swap if I need her to. She has a blog too and you should go and say "hi". Next up is a woman I met at the AAMQG meetings. She is funny and outgoing and amazingly creative! I have never seen something that she made that was not incredible. I got to know her better at our quilt retreat and recently we had a chat on Instagram. She is Houseofduke1, and her name is Vicky. We had a meeting on Wednesday and when I walked in she grabbed my hand and pulled me into another room with a package in her hand and a smile on her face! I opened the card and the box and her thoughtful gift brought tears to my eyes. 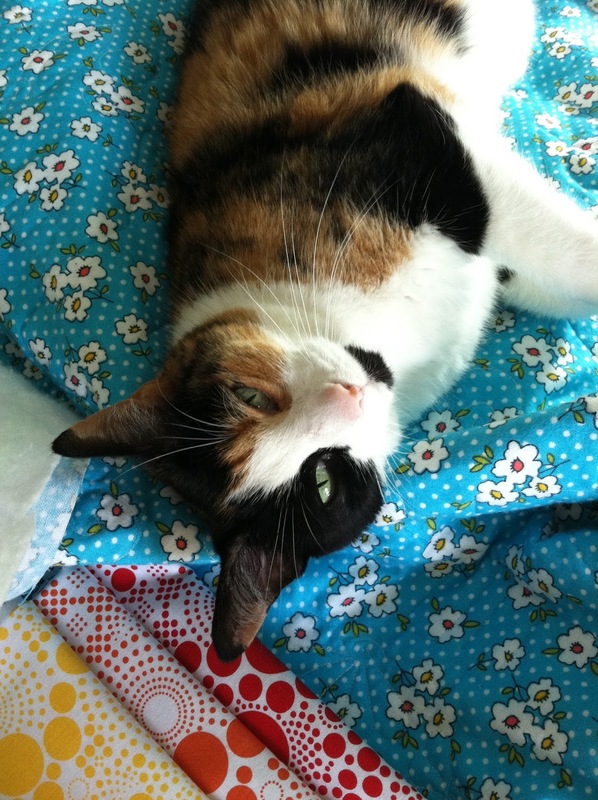 She had made the most amazingly, adorable kitty pincushion. understanding how much it would touch my heart! She told me I have to think of it as my "I am amazing" trophy! Thank you, my sweet friend, you lifted a few straws and I am grateful. I bet you want to see this amazing gift right? Thank you to my amazing friends, new and old. You guys in my herd are amazing and I would not ever trade you. 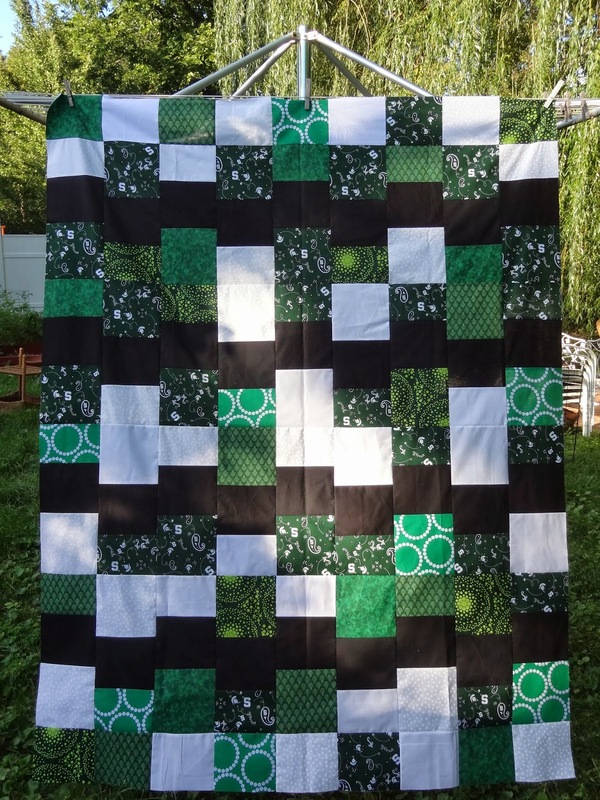 came across a pattern that I thought would make a great donation quilt. It is called Cloud Nine and is by Villa Rosa Designs. 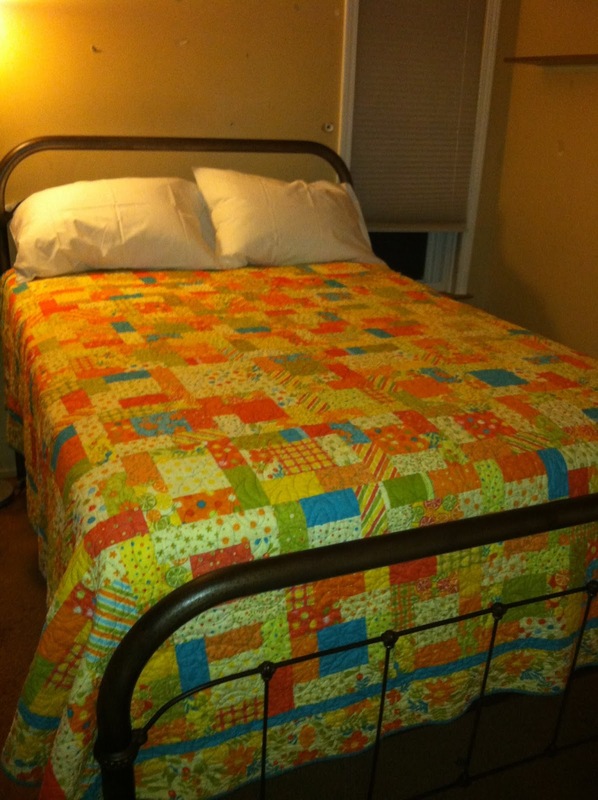 I decided it would make a couple of great quilts for Margaret's Hope Chest. I like the look using the white much better. I am making a third one for someone special so that will have to be shown later. This top goes together so quickly, and finishes at 56 x 70"
hope to have them back by Monday to bind and enter in the 100 Quilts for Kids. I am going to machine bind as that will go so much more quickly. What is your go to donation quilt pattern?? Many thanks to the Fat Quarter Shop for their generous donation! I am so happy to have them as a sponsor. I used the Random number thingy and it said "60". "I like the Cypress colorway best. By the way, I am supposed to let you know that there is a LOT of peacock Christmas stuff at Hobby Lobby again this year. My mom says that's in case you don't have anything else to spend your money on." She happens to be the daughter of a friend of mine from blog land! I love it when things work out like that. I will forward to the FQS for them to put it right in the mail to you! thank you for reading my blog even when I don't have giveaways!! That seems to be what my sewing consists of lately! Things completed that I can't share until I gift. New projects begun for gifts. 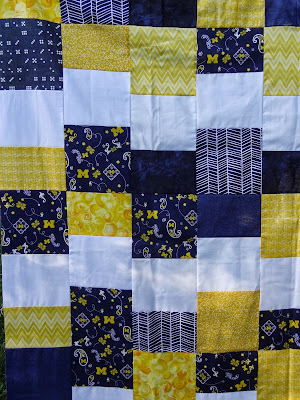 Why begin a few new charity quilts of course! this would be a perfect Margaret's Hope Chest donation quilt. although I am not sure it will be finished in time for that one, but I am going to try. I donate all year to MHC though. It was a super easy one to make and went together quickly. I am planning on making a Michigan and Michigan State one. I figure they get a lot of girlie quilts so thought the sports teams would be a good idea. Last year Carin from MHC told me they were the first 2 chosen! Makes me feel so good!! The top is finished but my quilter is out of town for the week. Not sure she can get it done in the time frame to make it for the 100 quilts, but I am going to try. Maybe I will get the MSU top finished this week? I have it all cut out. Planning on laying it out tomorrow night at quilting where I have a BIG space. I also cut out a NCSU top with this pattern to use for my daughter who is attending school there. 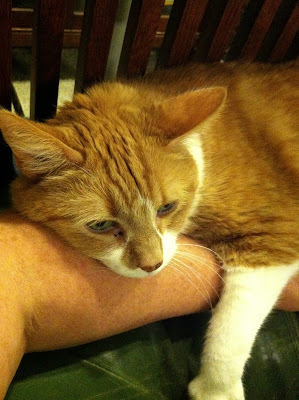 I thought I might be a nice couch quilt. put her arms around my arm and would not let me get back up for a time. I decided it was time to try a new recipe this last week too. It was called Meatball Sandwich Casserole and it was amazing!!! Even my hubby loved it. Super yummy and super easy, my kind of dinner!! LOTS going on with my dad, long story short we are moving him into a retirement community. The estimated move will be the first week of October. WAYYYYY too much work to do to get his house ready to sell too. Tula Pink Swap Begins and A Tula Pink Giveaway! I am hosting a Tula Pink Swap of 10" squares. I have done this before and we are into round8/9. If you are interested please visit the Flickr group right here and sign up! Be sure to read all the instructions first though. 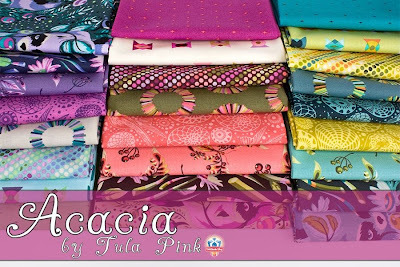 The Fat Quarter shop is sponsoring a giveaway of one color way of the New Tula Pink line. The fabric is super gorgeous, as usual. 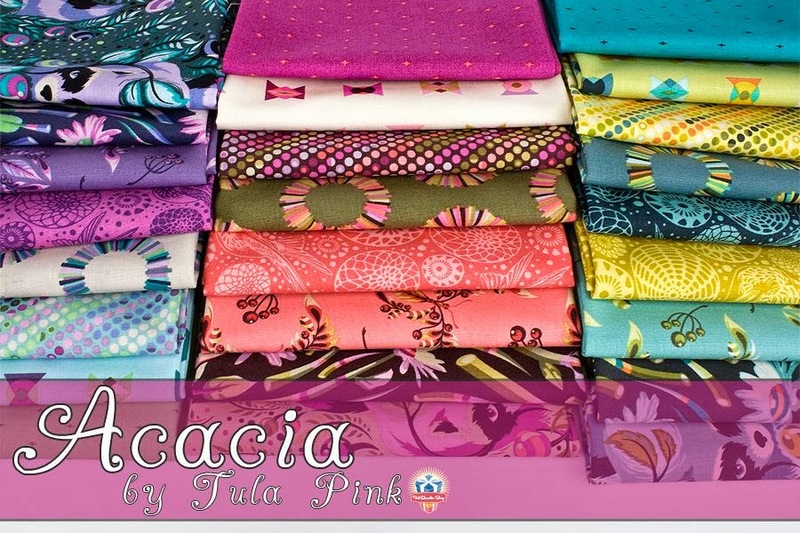 Would you like to pick up a FQ bundle of Acacia too? Comments are now closed for this giveaway! Go to the Fat Quarter Shop's listing for Acacia which is found here . Then come back and tell me which color way you would choose if you won! a way to contact you if you are selected as the winner. YOU will be sad to have missed out on the fabulous fabric!! I will draw the winner on September 20, Friday. Thanks to the Fat Quarter Shop for providing such beautiful fabric for the giveaway! Now go show them some love and order some fabric!!! That's what I have to share with you today, bits and bobs. I was trying to get the binding on a quilt recently and had a little help. She was in such a state of bliss I could not bear to move her! 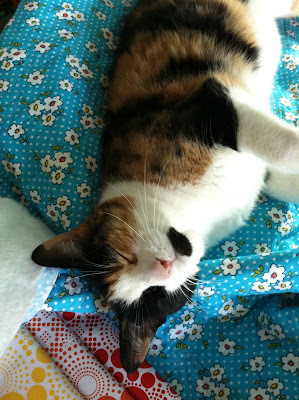 She just kept rolling around on the quilt and purring and purring. 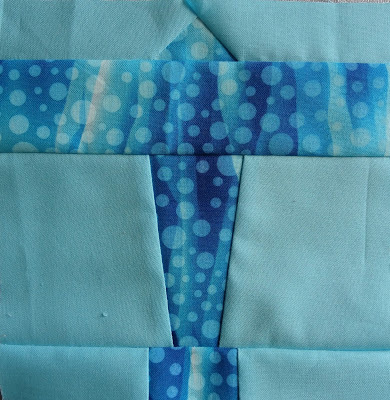 There is some good vibrations (literally) going on with this quilt! 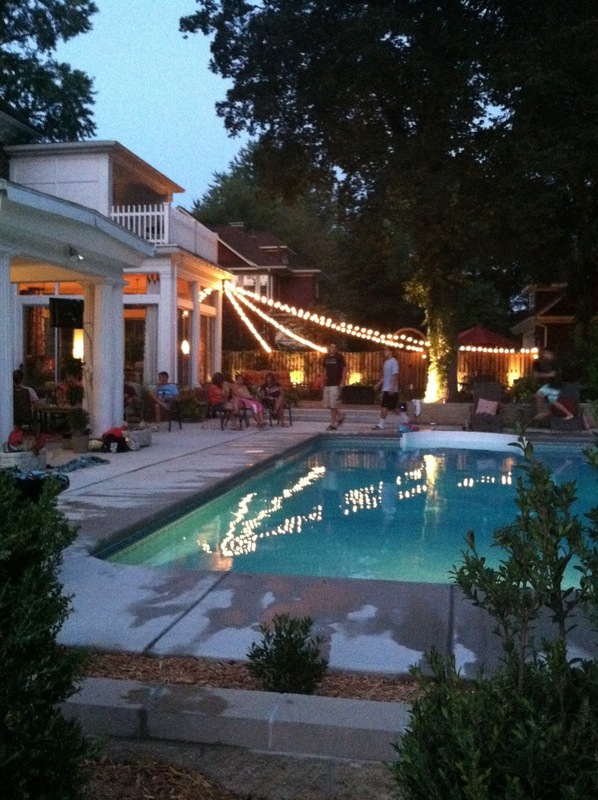 Over Labor Day weekend we went to my BIL and SIL house for a pool party. They just put this pool in a few weeks ago. Isn't this a pretty shot? You know that my son moved out the beginning of August. but we did manage to get it cleaned enough to put in a guest bed. A LONG time ago we bought this antique bed. It is made out of wrought iron. It had some paint on it and it really needed to have to paint taken off and rust removed then painted. We did not get so far as to get it painted but it got sanded and ready for a new mattress. I took the quilt off of my own bed and put it on this one. DD2 came up from NC to stay last weekend and she now had a beautiful new bed to sleep in! New sheets, new pillows and a homemade quilt. She also put us to work cleaning up the yard, trimming bushes and cleaning off the deck. Dang that girl is a force to be reckoned with!! I wonder where she gets that from?! and offered them to us. The seats were awesome and we parked about this close to Spartan stadium! 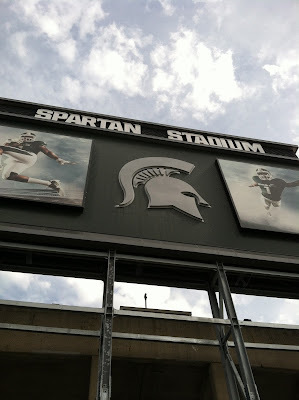 Hubby's other brother and family also have season tickets so we found them and did a little tailgating. Look who joined us. 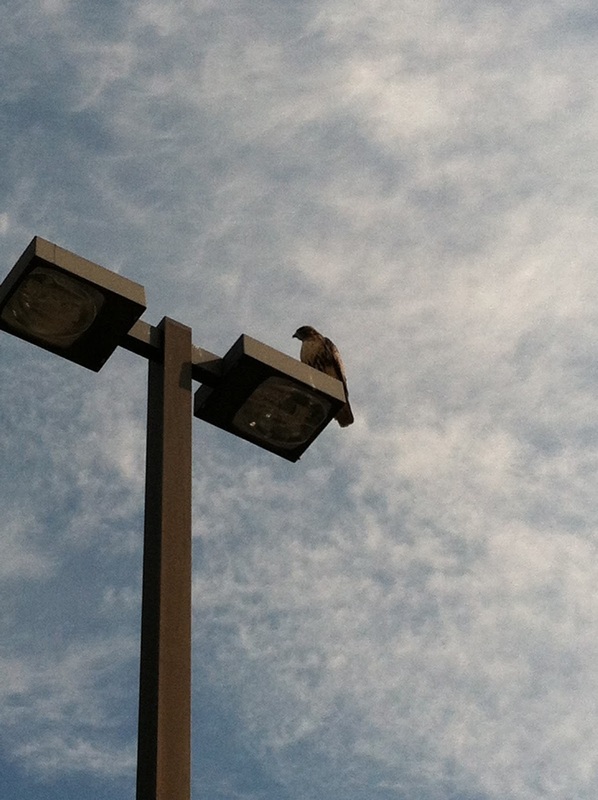 It was a beautiful Red Tail Hawk and when it flew away it was breathtaking. Not much in the sewing department to report but life is busy and full. The Rustic Rooster is having a great sale!! Their BiG Fall Sale begins today, September 6th and goes through Tuesday September 10th. To receive 25% off your entire order, just enter FA13 in the check out box. 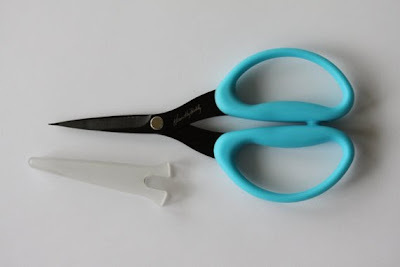 They have the new Karen Kay Buckley scissors in stock. I got to try these out recently and they are wonderful! There are 4 different sizes to choose from. all the stuff we all love to buy. And really, how can you pass up 25% off your total order?? Now, run right out and go shopping. It is my turn to be the queen in October in my Ima Bee. I get to choose a block for a quilt. I have been fretting and fretting about what to do. There are a lot of really cool blocks out there. I always feel guilty asking people to make some of the more difficult ones though. I know I don't have a lot of time. I think this quilt will be for our newly made quest room. My hubby will also have a desk in the room and probably some hobby storage in the closet. Because he will be spending time in there I asked his opinion. I showed him some of my choices and he had to choose from there. I really loved the small improv houses with lots of open space. He is MUCH more traditional than I am. I showed him a few others and finally I thought of one that he might really love. so I am thinking that airplanes would be cool. 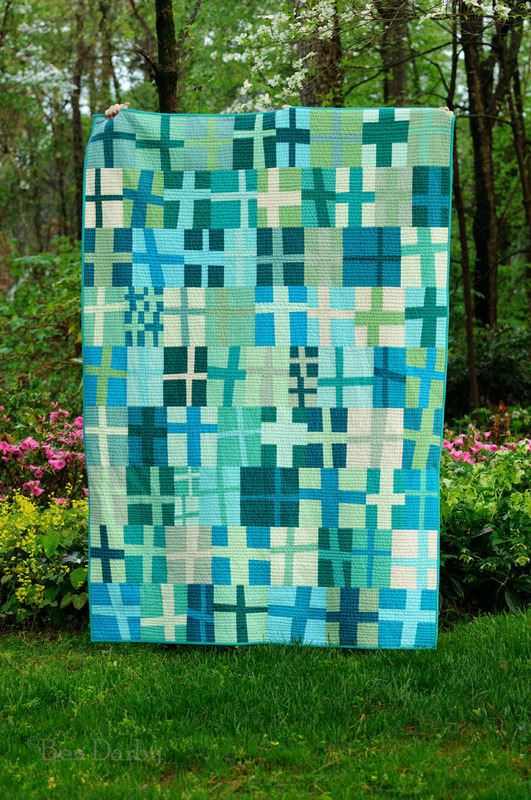 I also love this cross quilt and the cool, calming colors. So I think I am going to ask for airplanes made in this color palette. improv style around the outside as the border!!! I could ask folks for the words or the airplanes or one of each. If you were in my bee which would you rather make? Each person makes 2 blocks so I could have almost the entire alphabet or all the planes. I am kind of leaning toward all the planes but thought I would ask what you guys think. I would give a max for letter size and it could be fun to get all the alphabet too. The last day of our vacation was even more fun. We spent Tuesday night at a B & B called the Sturgis House. It was a beautiful old home in East Liverpool that used to be a funeral home! The sitting room on the main level. The coffins were stored under this room. More of the parlor, looking into the front hallway. The claim to fame of this house is that this is the place public enemy number 1 was interred. Pretty Boy Floyd. He was killed on a farm just outside of town and brought here to be embalmed. His mother requested he be sent home so the actual funeral did not happen there. They do still have the desk mask that was made of him though. As well as loads of other historic paraphernalia pertaining to Pretty Boy Floyd and his death. We had to pass over this rickety old toll bridge, I called it a troll bridge. I was so excited I could hardly contain myself!! I have been collecting older Fiestaware for years! I also use the new dishes for my everyday dishes too. At one time with all the add on's they used to employ over 4000 people. Now it's somewhere around 1000. We took the 2 hour tour of the factory and it was very interesting. I can't believe how much of the pottery they still make by hand. I could not resist all the beautiful colors for pictures, so here is some eye candy for you. There are WAY too many photos to share here but this was in the museum. This is some of the old Fiewtaware and the Lilac, which was the first color ever retired. This is a piece made in the color Raspberry, only this one bowl. Sure wish I had one of these!! Funny story, as we were driving toward the factory there was a pile of what appeared to be broken ware, white and lots of colors. Hubby told me that's not what it was but on the tour we found out it really was broken ware. They are supposed to bury the broken ware. Some company approached them and asked if they could use it to make counter tops with. OMG I so need this counter in my kitchen!!! Last but not least the piece I left behind. The dancing lady cookie jar. I really wanted to take one home, but they were kinda pricey. This one is in the Lemongrass color. This one was in turquoise. Guess I better start saving my pennies! I hope your Labor Day was a good one, mine was!